Features: Incredible documentation dating back to order date on 5/15/63, original invoice & much more. 3rd Place at Legends of the Autobahn, Monetery, CA. This desirable Mercedes 300SE Coupe was ordered by Dr. Williams on April 5, 1962 in anticipation of receiving the car via the Mercedes Benz “Safari” (European Delivery) program. A copy of his letter confirms the telephone discussion with the local MBZ dealer to arrange for a factory delivery of his 300SE Coupe that he picked up in Stuttgart at the MBZ factory on September 11, 1962. Reportedly, as part of the purchase, Dr. Williams agreed to make the car available for the Chicago Auto Show for a week in order to allow Mercedes Benz to highlight the 1963 Mercedes Benz 300SE. Subsequently, the car has a history of ownership in Southern California and most recently, as part of a significant collection of collectible vehicles in Northern California. With an already impressive list of convenience features and technical advances, the Mercedes 300SE represented the “Best of the Best” in Mercedes Coupes. Well ahead of its time, the car featured hydropneumatic adjustable suspension, an OHC fuel injected engine, and power steering. This example is fitted with air conditioning and a sunroof, features that appeared on an estimated <10% of the approximately 2,200 cars produced. With a delivered price of $13,161.40 in 1963, the Mercedes represented a very costly vehicle in the day. To put this price in perspective, according to “Flashback 1962” Flashback 1962 the median family income was $6,000 with the average new house costing $15,000.00. Also of interest is the fact that the 300SE Coupe, when new, was slightly more than a 300SL Roadster. For a fraction of the cost of a 300SL roadster today, this cars rarity, build quality and engineering features make it a very appealing example and sound investment opportunity. This Mercedes 300SE Coupe represents a lovely example of a car from an era when cars were built with a completley different mindset from today’s automobiles. This particular car will have appeal to a collector / enthusiast as a documented, numbers matching car with a fascinating history, excellent cosmetics, and strong drivability. The quality of the hardware and detailing in the 300SE reflect its high initial price and add to the beauty of the elegant, pillarless coupe. This 300SE presents very well with classic body lines and quality German panel fit. The fitment of the doors, trunk and hood is excellent. The exterior of the car is beautiful, straight, and free from any signs of rust. The paint is deep and lustrous, and blemish free with the exception of the most insignificant of imperfections that are too small to be seen in the photos, and do not detract from the cars striking appearance. The car received a complete, high quality respray from its original White DB50 to the current and, in our opinion, more attractive black color. There are no indications of partial touch-ups since the car was repainted with the factory invoice being the only support of the cars original color. The chrome and other exterior brightwork is in “California condition”, free from pitting, scratches or dullness. The classic Mercedes grill is also in lovely condition, free from damage and adorned 3 badges including; “European MBZ Delivery, Stuttgart”, “Deutschland”, and the “International Sports Car Club.” The glass is excellent with original “Sekurit” markings on side, rear and vent window glass. Window rubbers are in very good condition with all windows, including the vent windows with the file supporting replacement of many “soft” trim bits. All windows function properly. Emblems and exterior lens are correct and in excellent condition. The interior of the car is finished in correct MB Tex seats including the factory fitted optional headrests. The seats show generally well with a slight separation of the seam on the right passenger top portions of the seats and some leather aging on the very lower vertical side of the driver’s seat. The door panels and headliner are excellent as is the gray wool carpet that is covered with period style black and red cocoa mats. The rear seat is excellent including the top of the seat that often shows sun damage. The arm rests in the front and rear are both in excellent condition. The elegant trim in the interior compartment is in lovely condition including the considerable wood on the dash. One crack exists on the right passenger side of the dash but the majority of the wood is unusually nice, including the trim that surrounds the inside of the windshield area. The steering wheel is in exceptional condition, free from cracks with bright chrome, and a working horn. The 300SE is fitted with the factory Becker AM/FM radio that is functional and includes two rear parcel tray mounted speakers that have a factory or vintage appearance. The sunroof opens and closes properly and seals tightly. All of the gauges are functional and the car shows excellent oil pressure when cold and warm. Under the hood, the engine compartment and engine have been properly maintained and finished with correct factory finishes and proper hardware. Clearly serviced by professionals who pay close attention to correct Mercedes-Benz parts and service guidelines, the engine appears well finished and correctly appointed and very tidy indeed. The car is solid mechanically, with wonderful driving manners in every respect. The car starts easily, whether cold or warm with no smoke at the tailpipe. The composed, stately nature of this car is a genuine reflection of the superb ride engineering, advanced brakes, and suspension Mercedes-Benz delivered in their vehicles. Mechanically the car performs as one might expect, offering smooth and composed power delivery, leisurely touring , and solid braking. The undercarriage and chassis components are well maintained, solid, and clean with no evidence of structural compromises to the car. The car is offered with history dating back to the date of delivery, factory dealer brochure, jacking equipment, factory spare wheel/tire, and available service records. Within the past 1,000 miles the compression was checked and revealed excellent readings between 150-140 psi in all cylinders. The car pulls strongly through all of the gears with no hesitation. The suspension is very tight and solid. The air conditioning equipment is all present and has been serviced over the years but nor used in some time. Ongoing service has been performed by Mercedes specialists and available receipts are included. One of the Mercedes 300SE’s most appreciated aspects is that they are truly mechanically modern enough for everyday use on today’s roads, and while this car certainly lives up to that standard, it clearly has always been a well looked after limited use vehicle. This is an excellent opportunity to acquire an appreciating 300SE that checks all of the proper boxes; clean cosmetics, classic color combination, solid undercarriage and strong mechanicals. Whether used by a seasoned collector, or the weekend enthusiast, this car deserves the serious consideration of anyone in the market for a limited production and increasingly difficult to find 300SE. 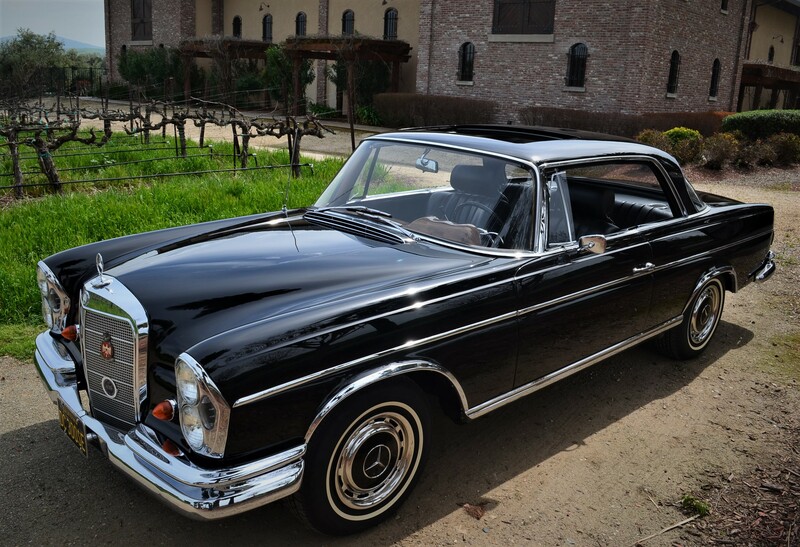 Presented in its classic black with black leather interior, this Mercedes-Benz 300SE Cabriolet is a handsome, sophisticated, touring car with all the prestige and distinction in a very drivable package. Comfortable for four passengers and room for an ambitious fifth occupant in the rear seat, ample trunk space for outings, golf bags, or long distance travel, this cabriolet offers enthusiasts a comfortable yet commanding vehicle ready for leisurely enjoyment. The Mercedes 300 SE Coupe was introduced in March, 1962 and represented the “Best of the Best” of the already impressive 300 SE “fintail” sedan, but in Coupe form. Mercedes Benz took the W112 to another level with luxurious appointments including considerable wood trim, leather interiors, reclining seats, and available factory A/C and other options. Utilizing the 2,996cc OHC six-cylinder engine The most expensive, rarest and fastest Mercedes “Finback” sedan was launched in April 1961. The 300SE received the chassis code W112 and was powered by a 2,996cc OHC six-cylinder engine, ultimately developing ~185 bhp, it was fitted with Bosch fuel injection and six injectors, not the two fitted to the earlier MBZ 220SE. Top speed was 124 mph, and 0-60 in 12 seconds was impressive for a Coupe in this era considering its size, and weight. Other mechanical features included four-wheel disc brakes, a self-leveling air suspension system with a pump linked to the power steering pump, and a 4-speed automatic transmission. The 300SE was easily recognizable by extra chrome, elegant interior, and whitewall tires, and the double-stacked 5″ round lights with separate turn signals. Prices of the 300 SE Coupe have risen sharply over the years as good examples become increasingly difficult to find. A total of 3,127 coupes and convertibles were built making the SE Coupe rare, indeed. How much experience do they have with collector cars? How many positive collector car vehicle sales have they completed (positive eBay feedback)? How detailed/complete is the description of the vehicle? Do the photos show details of the interior, exterior, top, chrome, etc. or are they simply “glamour shots” taken from a distance? Does the seller have a Surety Bond to protect the financial transaction? What about insurance, licensing by the state, and a local business license? Does the seller (if a business) have any DMV (Motor Vehicle) complaints and/or other history of legal action, grievances? Does the seller enjoy a favorable local and national/international reputation? Can the seller assist with funding sources, transport and out of state/country sales? Classic Cars Ltd. has been in the same, small, California town for over 25 years. We operate a small “brick & mortar”, indoor showroom, and specialize in the sale, consignment, and purchase of sports, high performance and specialty vehicles of all types. We have a particular interest in sports cars and unique vehicles. The majority of our vehicles come from local, private owners and collectors, and many were sold new in California. We appreciate that rust free cars, with excellent documentation and history are especially attractive to our buyers both locally, and around the country. As a result, we do not purchase our collectible cars from “distressed” sales, such as wholesale auctions, salvage sales, or lien sales. We do not sell vehicles with salvage titles, or those that have a history of significant accident damage or repair. We have sold hundreds of unique, classic and collectible vehicles and regularly deal with buyers that have not had the experience of purchasing a large (both physically and monetarily) item on eBay, or through an Internet source. Our eBay feedback is 100% positive on all vehicle sales from customers around the globe and is a reflection of our commitment to accurate, complete, and thorough vehicle descriptions. We have been shipping vehicles for years and have established excellent contacts that are not only high quality but very price competitive. We do not use brokers, terminal shipping or other discount methods. Call us or email for a quote directly to your home or office. We are often able to obtain quality enclosed transportation (the kind of travel this car deserves) for the cost of open shipping. Please review our feedback on eBay (user name Never22Many) representing over 1,000 positive transactions to buyers all over the United States / World. We are fully insured, bonded, and licensed for collector car sales all over the United States/World. We frequently sell vehicles to out of State / out of country buyers, and will be glad to provide references for buyers in your area. As with virtually all collector/specialty vehicles, we find that parts and resources are readily available for this (and most every vehicle), thanks in large part to the Internet. In addition to the purchase price of the vehicle, California buyers will be subject to sales tax, a documentation fee, DMV transfer fees and license/registration. Out-of-state buyers will be responsible for the purchase price of the vehicle and any local taxes/fees will be the purchaser’s responsibility to pay in their respective state. IMPORTANT NOTE: If the vehicle is delivered or driven in California and driven on California roads, sales-tax, license/registration and transfer fees will be assessed per California law. While we encourage telephone calls to discuss this vehicle in greater detail. Also, if you would prefer that we call you to answer any questions about the vehicle; shipping alternatives, etc. please e-mail us with your telephone number and will gladly get back in touch with you. We encourage inspections of this Corvette by serious, qualified individuals or professional inspectors. Please call at 925-846-1451 to arrange a convenient time. As with any collectible vehicle of this vintage we are unable to provide a warranty or guarantee of condition. However, we make every effort to accurately represent our vehicles, and highlight both positive items as well as areas that require attention. We ask that prospective buyers consider our eBay history/feedback, standing in the community, length of time in business, and other factors when purchasing a collectible vehicle from Classic Cars Ltd.
Minor cosmetic issues/flaws may be present on every vehicle (regardless of cost) including small chips, nicks, scratches, etc. that can be seen on even the best restoration, or even a relatively new, used “pre-owned” vehicle. Also, ownership of a collectible / specialty vehicle is more enjoyable if the owner is familiar with the “realities” of these unique cars. Unlike more modern day vehicles, these cars require regular, ongoing care/maintenance and some mechanical knowledge, patience, and understanding can make the experience considerably more pleasant. That said, collector / “specialty” car owners will tell you (emphatically) that they love their cars and wouldn’t trade them for anything!! The information contained in this description is believed to be accurate but, in some instances, has been provided by the car’s owner / owners or outside sources. As a result, we are unable to guarantee the accuracy of the information. We encourage verification of “numbers” and significant data prior to the purchase of any collector vehicle that you are considering. Please complete the following if we can answer questions or provide additonal information.